Because it says so in my tagline. This one isn’t about writing. This is more along the lines of my not-often-written-or spoken about, personal mission to make sure I do more building up of human self-esteem than tearing down (my blog tagline, in case you hadn’t noticed, “I strive to build others up so they may achieve their dreams.”) It’s something I take seriously; it colors the things I choose to share, the types of stories I write, and most importantly, how I interact with humans in general. My blog topic today, comes about from a conversation I had recently. I do so enjoy the people/teachers/leaders/guides I have in my life as they consistently expand my mind. 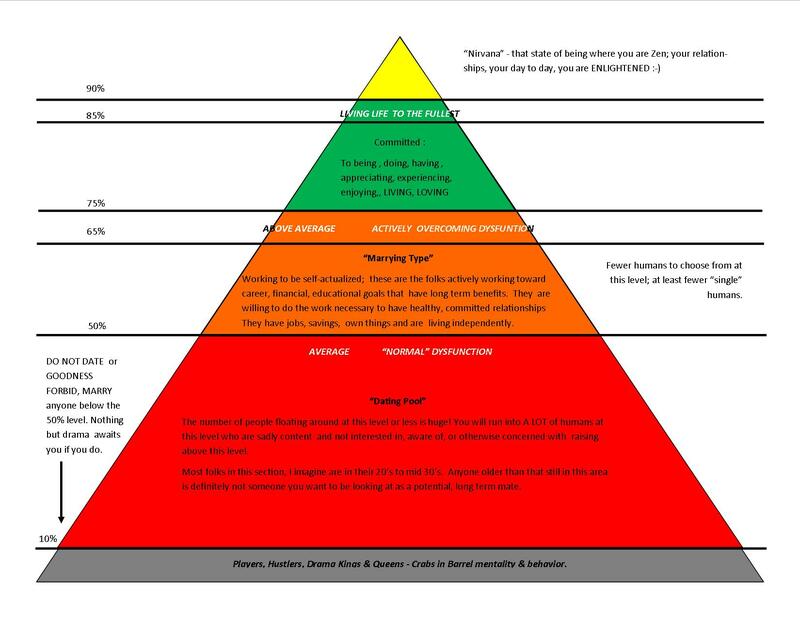 This gem is titled, “The Relationship Pyramid.” Perhaps you’ve heard of it? I had not, but once the concept was laid out, it resonated deeply so of course, I must share it. Mind you, this is in NO WAY meant to be taken as scientific fact. I have no idea if there are any in-depth studies to back this up, what I do know is that the more we talked about it, the more I realized it could be directly applied to my life. Based on my observations of the human condition, I’m not alone; there are plenty of people who could benefit from the concept. I apologize to whoever originated the idea as I am unable to give proper credit. I’m sharing it here not as if I came up with it, but instead because I think it is so SPOT on. It’s a lesson I wish I’d been taught a hell of a lot earlier in my life; it’s one I hope to teach my daughter so she can apply it right away, and it’s one that I’m utilizing in my NaNo this year as I think it’s worth sharing on a grand scale. Okay, not that the resulting book from my NaNo is going to reach that wide an audience, but just in case this is the book that finally garners some major readership, I definitely want the Pyramid to be a prominent feature. Pardon my lack of graphic design skill. The entire pyramid represents people – the humans you will come in contact with throughout your life time. The descriptions that accompany each level are my interpretations of what each level represents as they were explained. It’s my personal belief that humans have the ability to move up or down as they so choose. I choose to work at moving up. My reason for sharing this is to introduce the concepts, generate some discussion, and encourage folks to not settle for lives / loves that don’t elevate them. It’s perfectly cool to love who you are, where you are, but don’t settle for mediocrity. Keep striving to move up the pyramid, keep bettering yourself and spending time with people who want to see you reach your potential. Keep in mind too, comparing yourself to others isn’t conducive to your journey. You’ll meet people in all levels of the Pyramid and I don’t think you need to be concerned with judging whether or not you’re higher or lower than they are. Your focus is on being your best YOU and that has nothing to do with your cousin who earned her (his) Ph.D. at the ripe old age of twenty-five, or your “used to be best friend” who still lives in his (her) mother’s basement and is constantly telling you how much you’ve changed now that you have a steady job and want to get your own place. When it comes to romantic relationships, decide where you are on the scale and go with it. Are you in the fifty percent? No stress; date, have fun. As you move up though, pay attention to who’s moving up as well. Granted, the pool of available singles shrinks considerably the higher up you go, but that’s okay. You’re doing okay for yourself, so it’s not as if you NEED or HAVE to have someone in your life to be happy or whole, it’s just that if you want a relationship, then be sure you’re picking someone with whom you can share your upward momentum. I don’t believe you have to be going for the exact same things, but I think relationships work best when both people are first – as whole as they can be, second – are consistently looking to better themselves, and third – are supportive of others doing the same for themselves. As I like to do, let me summarize with this – the people, places, things, and activities that garner your attention should reflect and support you where you are as well as where you are striving to be. Now, if you’ll excuse me, I’ve got some NaNo writing to do.